Turkish and Israeli ministers say they are close to mending relations that were severely strained after the 2010 killing of nine Turkish activists on a boat seeking to break Israel's economic blockade of Gaza. In the latest negotiations to thaw bilateral relations, Turkish and Israeli diplomats are reportedly due to meet this month. Turkish Deputy Prime Minister Numan Kurtulmus last week announced that a deal was close to being reached. Political columnist Semih Idiz of Turkey’s Cumhuriyet newspaper says there is powerful political momentum behind rapprochement efforts with Turkish President Recep Tayyip Erdogan backing the process. "... First with Erdogan coming out and saying, 'Whether we like it or not, we have to have this' and then various ministers saying it is about to happen, it is on the verge of happening. I think it is actually on the way. I think they are probably working out the fine points," said Idiz. Israel has already met one of Ankara’s demands, by apologizing for the killing of the nine Turkish activists aboard a boat seeking to break Israeli's economic blockade of Gaza. Turkish media are reporting agreement has been reached over the amount Israel will pay in compensation to the families of those killed. Columnist Idiz says a compromise is close to being reached over the blockade. "I think the way the Gaza blockade demand by Turkey will be overcome, is that the blockade is not necessarily raised, but that Turkish companies and Turkish aid groups have access to Gaza and that would be solved in that way," said Idiz. Rapprochement efforts come as deep differences remain politically between the leaders of both countries, who observers point out make little secret of their dislike of one another. Political scientist Cengiz Aktar of Istanbul’s Suleyman Sah University says with both countries isolated in the region, pragmatism is driving the effort. "The deal between Turkey and Israel is between the two loneliest states in the Middle East. This is a typical convergence of interests, that does not mean, that suddenly Israel and Turkey love each other, far from it," said Aktar. Distrust could still jeopardize rapprochement efforts. Western media reports say Israel is demanding Ankara expel leading Hamas members in exchange for concessions over Gaza. The recent appointment of Avigdor Lieberman, a well known critic of Ankara, as Israeli defense minister further complicates bilateral negotiations, says political consultant Atilla Yesilada of Global Source Partners. 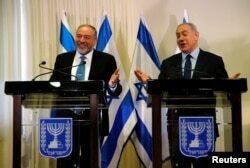 Avigdor Lieberman, head of far-right Yisrael Beitenu party, (L) and Israeli Prime Minister Benjamin Netanyahu deliver statements to the media after signing a coalition deal to broaden the government's parliamentary majority, at the Knesset. "I am quite skeptical, given the fact that Hamas is still in Turkey, and according to the Turkish press, the appointment of Mr. Lieberman as the defense minister, who is a known Turkophobe, does not make matters easier," said Yesilada. "This reconciliation has been in the agenda, since the turn of the year. And every time an authority is asked when is it going to happen? 'It is only a meeting away;' but that meeting never happens." Deepening economic ties are widely cited as a powerful driving force behind rapprochement, particularly in the field of energy, with Turkey seen as an ideal market for Israel’s newly discovered natural gas reserves. Observers point out shared concerns over Iran's rising influence and power in the region are also powerful forces to bring Israel and Turkey closer.